Create barely there looks or smouldering smokey eyes with theBalm's Appetit, an eyeshadow palette filled with a selection of delectable, talc-free shadows in neutral and smokey shades. 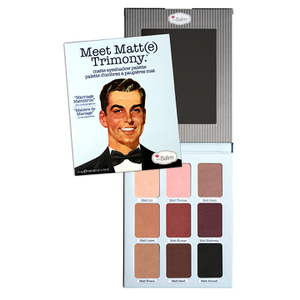 Combining nine complementary eyeshadows with shimmer, matt and foil finishes, the versatile palette allows you to create a range of looks that add subtle depth or bold definition to the eyes. The shadows can be used both wet or dry; use dry for a more muted finish, and use wet for added shine and drama. The carefully selected hues are highly pigmented and effortlessly blendable. Complete with an integrated mirror.